When merged in just the right way, rustic and industrial styles can make one happy marriage. Case in point: the Drystan queen panel bedroom set. A refined take on barn board beauty, its complex, replicated wood grain showcases hints of burnt orange and teal tones for a sense of weatherworn authenticity. Love to read in bed? 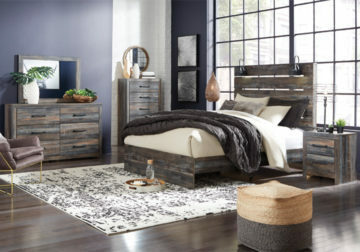 You’re sure to find the pair of retro-chic light sconces and USB plug-ins on the open-slat style headboard such a bright idea. 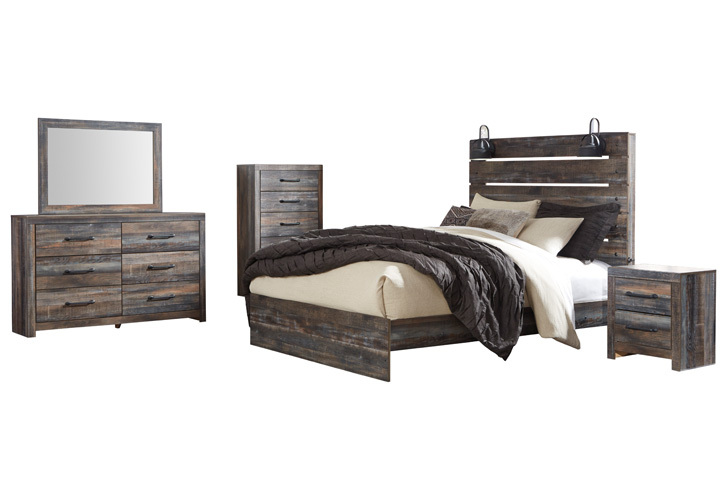 *The queen bedroom set consists of a queen panel bed, dresser, mirror, and nightstand. Chest not included, but is available to purchase separately.